Microsoft has announced that it has finalized its $8.5 billion Skype acquisition. 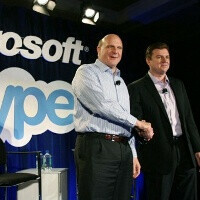 Skype will now be integrated as a separate business unit withing Microsoft. The future is expected to bring Skype on all levels in various Microsoft products. The deal has passed approval in the States and the European Union but it’s still up for review in some countries like Russia, Ukraine, Serbia and Taiwan. There, it will be closed after the review process is over. What are the possibilities ahead? The most obvious place for Skype integration are, of course, Microsoft’s Lync and the Windows Phone platform. But we shouldn’t rule out Outlook and even Xbox Live out of the picture in the long term. There's no fixed timeline, though, and analysts point out that Lync integration for once could take up to two years as the code has to undergo significant changes. When it comes to Windows Phone, the integration should happen much quicker as Skype is already on Android and iOS. It could and probably would get a deeper level support, aiming to rival Apple's FaceTime. The biggest hurdle to this are carriers, which have understandably resisted the integration of a VoIP client in a smartphone. Currently users won't likely see any major differences after the acquisition, but it's expected that Skype gets a Metro UI redesign once it gets baked in Windows Phone. The Internet has changed video calling for millions of people. Explore some of the numbers and stats showing the scope and impact of how Skype is helping people stay connected. Tony Bates, president of the Skype Division of Microsoft. All information in this release is as of Oct. 14, 2011. The company undertakes no duty to update any forward-looking statement to conform the statement to actual results or changes in the company’s expectations. I just can't ask ... How is this Microsoft's fault? Just a thought, but how much would voip be less intimidating for carriers, if they just allowed Video chat on their network over 3G which has been part of the standard since 2004. AT&T and T-Mobile don't support it, and I know for international stuff, VOIP will always be preferred by customers, but at least domestically you shouldn't need a 3rd party app for video chat. Microsoft announced plans for Skype into their Xbox Live service at this past E3. So it's not for the "long-term." It was well under way even before this deal.